Many people have the most common problem that whatever they learn they forget quickly. Not everybody is blessed with a good memory. There are few people with exceptional memory that they can learn and remember many things effortlessly. However, there are many, who struggle to remember even the name of the person they were just introduced to. Our brain absorbs a lot of useless information every day. Conversations on the roadside or on a tea stall or any useless news we hear, most of that information is not needed. The brain naturally forgets these things along with much useful information. Clearly, this is a huge problem and shows the importance of following strategies to retain what we learn. So it is not the fault of our brain that it forgets things, but it comes from our mistakes. Just as we strengthen any other muscles in our bodies, we can train our mind to remember more and learn anything faster. We can use our brain as much as we can, and it depends on how we train it. As polishing refines the look of diamond and gives it a flawless finish, we need to polish our brain in a manner so that we can recall anything perfectly even after a long time. I will show you some of the best techniques & my own own experience that will help you to memorize fast anything anytime that you have learnt or studied. SOL stands for Speak Out Loud. Whatever you study, read out loudly instead of reading it silently. Speaking out loud causes us to remember better than to read silently. In this way, our brain captures more information. The brain uses memory pathways to learn and remember things for a more extended period. Here it uses the auditory channel to store data. Reciting in front of the mirror also makes it easy to learn and remember. You can also say it without looking at the book. Firstly you are writing whatever you have studied – this is one thing always works out to remember stuff for quite a long time. Secondly making short notes will help you in revising things efficiently. Reading the same chapter second or third time for revision will take more time than revising from brief summaries of the same topic. It will decrease your revision time, and you can revise it multiple times as well. This trick always helps before exams for quick revision. Suppose you are reading History book and if it is getting difficult to remember which battle held when or when you are solving math problems it is getting tough to recall some formulas. You can write these things on a sticky note and place it near your bed or on the wall near your study table. Watch it every day and as many times as possible. Visualization is the essential skill when it comes to memory. It will help you to memorize all toughest things very quickly. Mnemonic help us to memorize important facts and principles. It can help us to recall larger pieces of information. It can be used to memorize things much easier that would otherwise be difficult to remember. Make mnemonics of certain things which is difficult for you to remember. We all remember the colour of the rainbow because in childhood we remember it by a mnemonic VIBGYOR so all of us can recall it anytime, even in our sleep:-D.
We can also recall the sequence of operation in maths by this mnemonic – BODMAS. Use any technique of mnemonics to make learning easier. Recording lessons on your mobile phone is an excellent way of memorizing. We listen to new music, and after some time we can actually sing it because it gets stored in our subconscious mind. Do the same with your lessons. Record them and replay while travelling or anytime you want. It gives you multiple revisions without so much effort. Also, the information gets stored in the subconscious mind, and it helps you to remember for a more extended period. Visualised things, we remember for a long time. It is the second memory pathway to the brain. Our brain processes visual information 60,000 times faster than text. A study was done on two groups of people, where to the first group a picture of a few animals had shown, and the name of the same animals had shown to the other group of people. After three days people of the first group were able to recall a maximum number of animals, what they were shown and the second group of people merely recalled the name of 2-3 animals. Try to convert paragraphs in pictures or in a flow chart. Make mind map or diagrams wherever possible to memorize. In this digital world, we can take benefit of technologies where so many learning apps and lecture videos are available, for almost every topic. Visual learning helps in better retention than learning from textbooks because it sticks in our long-term memory. One study found that after three days, a person retained only 10-20 % of written or spoken information but almost 65 % of the visual information. Discuss the topic which you have studied with your friends and family. The best way to learn something is to teach it to someone else or mention what you have read. Because when you decide to teach or explain to someone, you organise your knowledge, improve your own understanding and recall, then only you explain to someone. This way our brain stores information for a long time. A healthy discussion can also generate more ideas in your mind about the topic and increase your thinking level also. You can even get some more information from your friends on the same subject. This technique can also help to remember things for a long time. Solve quizzes or give tests, topic wise or subject wise. When we write tests, we recall what we have read. 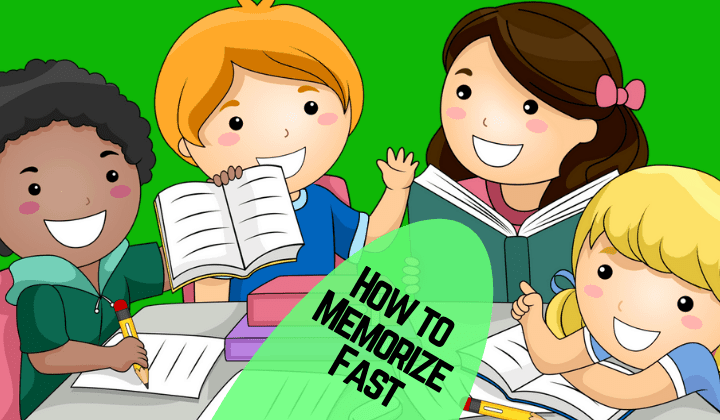 Recalling things at the mock test time and forcing your brain to work faster there, will always help you in actual exams. It also happens that in a mock test if we get some answers wrong, during evaluation, we get to know correct answers and also that where we went wrong. If you self-evaluate your tests, you learn so many things while you correct yourself, which you will not forget quickly. So try to give tests for every topic you learn and evaluate it yourself. When you go to sleep recall what we have remembered the whole day, even if you cannot recall everything, it is fine. Just write whatever you can. Once you are asleep, your brain will arrange all the information. When you wake up, information will be well, and you will find that you can reproduce it better. From the above ten ways, you can choose which memorization techniques suit you best to remember things for a long time and make your learning more accessible. Mentioning revision, at last, it means all the ten ways will not work out unless you revise your studies. These ten techniques make your revision easier. It makes anything perfect and long-lasting. A cricketer practices a lot off-field and then only he is able to perform on the field. If he does not practice as much as it is required, he cannot perform on the ground and soon he gets out of form and soon out of the team. Some so many cricketers did not last long in Indian team because they did not revise(practice) enough what they learned. Their practice is also one kind of revision for them. Same is the case with us. As much as you revise at home, the better you will be able to perform in your exam. So revise, revise and revise as much as you have the potential to do that and you will be able to memorize fast.